After spending all morning exploring the smalls towns of Riomaggiore, Manarola, and Corniglia, we decided to stop at Vernazza for lunch, before heading to our last stop, Monterosso. Our choice for the day was the highly recommended (by online reviewers and friends), Belforte Ristorant. It is located literally at the beach, on the left side when you face the water, going up a set of stairs. You will easily identify it as it looks like to be on top of a construction that resembles a fortress (sorry forgot to take pictures). 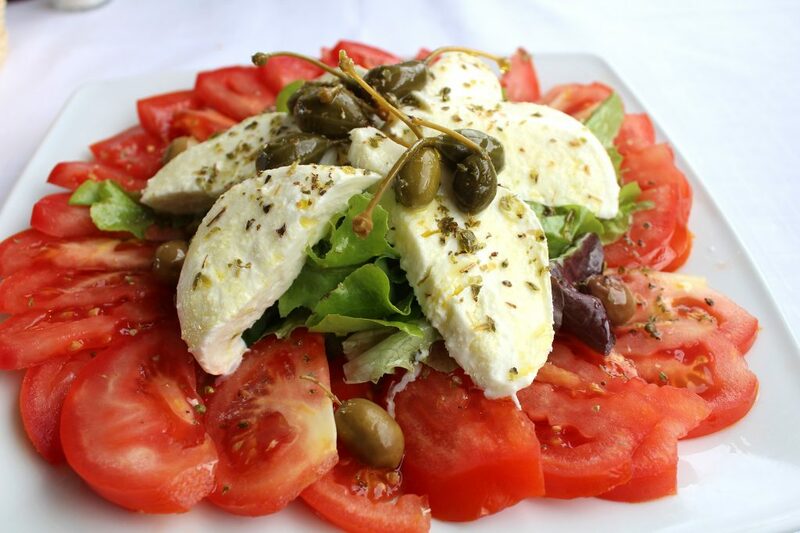 Caprese salad – Tomatoes, mixed leaves, basil, fresh mozzarella, olives, and capers. 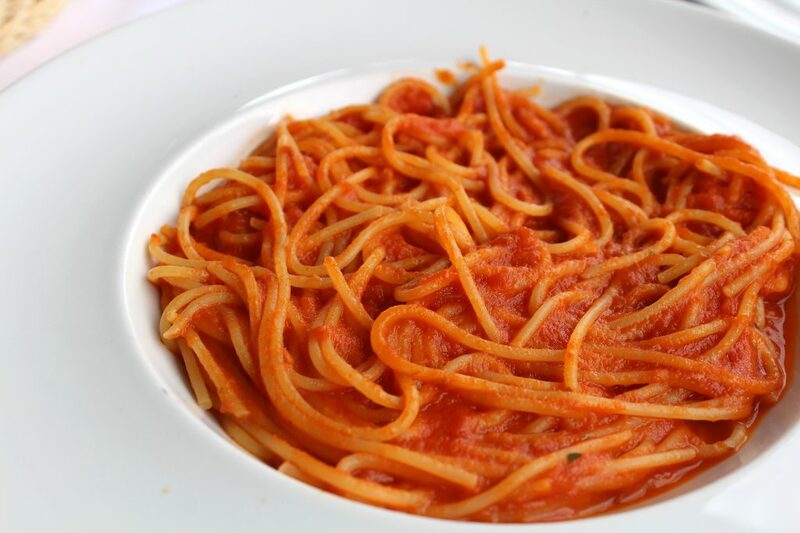 Spaghetti al sugo (tomato sauce). 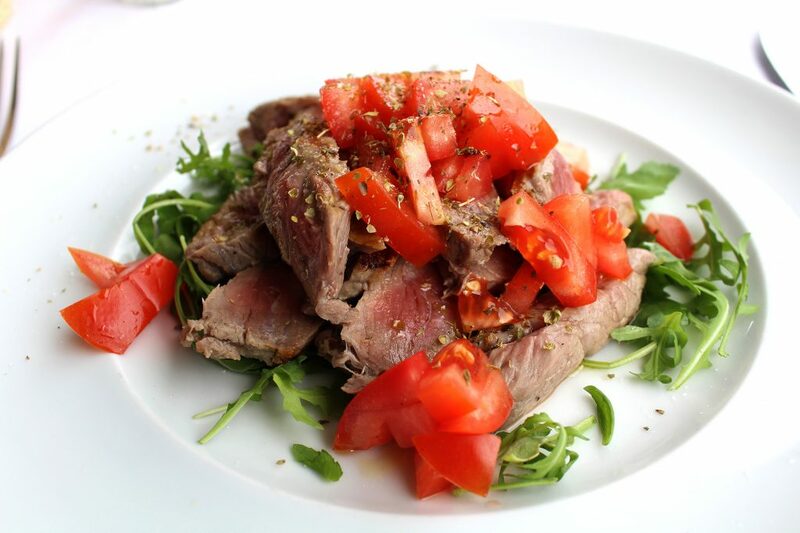 Grilled beef with rockets and tomatoes. Salad and pasta were gorgeous! Nothing to add or remove, great choice. On the other hand, our beef was a bit disappointing, bland and tasteless, although correctly cooked. Anyways, I understand that Hubby and I were a bit naive with our choice. Let me explain you why. But at the same time if a restaurant puts it on their menu it should be prepared as good as the others dishes, in my opinion. In a nutshell, the restaurant is good, overall; it also has amazing views. Considering that we were a bit unlucky with of our choice, the place has great options (we loved our salad and pasta), good service and amazing views. It is also incredibly popular during lunchtime, so if you can make a reservation or get there as soon as it opens (like we did). You can check more posts here on the blog about my holidays in Europe and also everything I published about Italy or Cinque Terre.